Buzz woke up grumpy this morning. Every morning Ed brings him from his own bed into ours before he leaves for work, he does the same with Bo, thus this morning Buzz woke up to Bo kicking him in his belly. He was not impressed. I moved Bo and told Buzz to close his eyes, have a beautiful dream, and then wake back up with a smile on his face. He did and I took some photos. This last one is my favourite. This sums up our mornings, Buzz laughing from jumping on the bed, Bo staring at you with his deep blue eyes, the boys holding hands. In the three months since the arrival of Bo the boys have become close, Bo watches Buzz when he is near, Buzz requests Bo at night when he won't fall asleep, holds his hand when they're together. When they are happy, they are lovely. My boy has a love of cars. The older boy. The young boy so far only has a love of familiar faces, warm baths, and milk. Back to the older boy and his love of cars. We encouraged it for sure by watching the UK version of Top Gear while Buzz played nearby on his road map rug with his giant collection of tiny cars. We buy him said cars when we are on shopping trips. For $1 and change he is thrilled, we talk about the colour, make, model, and year. This generally provides us with a long conversation (by three year old standards at least). Much to our delight Buzz started to recognize cars while we were out and about. Chevrolet, Mercedes,Honda, BMW, car after car he will name them, our version of the billboard alphabet game. When asked about his favourite car he might tell you Lamborghini, but when asked what he will drive when he gets big, the answer most definitely is a Toyota. My whole family drives Toyotas and so this practical decision is quite likely in his genes. He would probably choose a red Prius just like the little one he often carries in his pocket. If you look at pictures of Buzz you are likely to see a car in his hand or beside him on the floor, he has one with him at all times. I find them everywhere. The diaper bag, underfoot, the stroller, the car, in my bed, in Buzz's bed, in kitchen cupboards and for certain in the bathtub, they are everywhere lest he need one at a moments notice. We can't wait to take him to the car show next year, his eyes will be as big as saucers. My hometown is home to a great many classic cars, some of which are brought out to be shown along the roadside once a year. We were unable to go to see them this year, but when next we go and he is able to see his teeny muscle cars in life size greatness he will likely be thrilled. While children often go through stages of things they like, their interests changing on a whim, our sons' appreciation for cars has been here since before he could speak. I suspect this interest will stick around for a while. 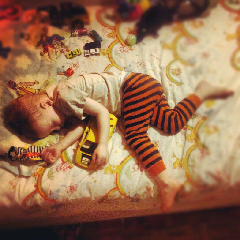 I bet his dreams are filled with cars (and hopefully rainbows and unicorns too), he does after all go to sleep surrounded by them. I love that he is so enamored with them, it is endearing and of course endlessly entertaining on road trips.